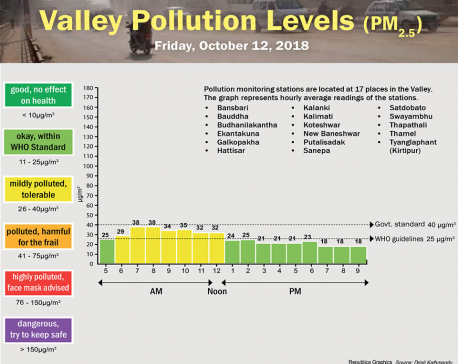 KATHMANDU, March 21: Pollution in Delhi and other Indian cities, which receives a lot of media attention, has a big impact on the health and wellbeing of Nepal's population also, according to experts. 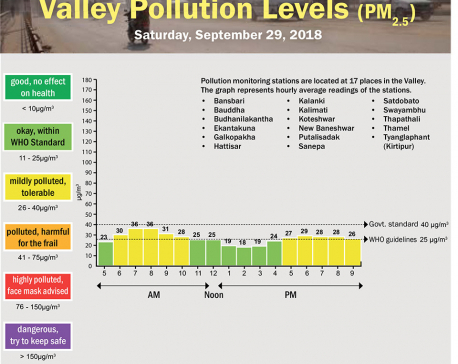 As air pollution respects no political frontiers, India's toxic air reaches Nepal when the air blows in certain directions, covering our skies with thick smoke haze mostly during summer. Such trans-boundary pollution worsens our already polluted air, compounding the effect on public health. Trans-border air pollution is common in districts sharing a border with India. One study conducted during March, April and May in 2013 using computer simulations found that two thirds of the air pollution in Lumbini originated in India, Panday said. 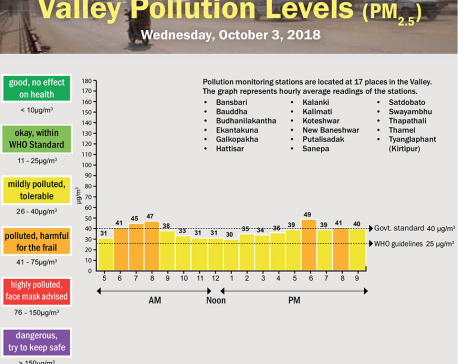 According to experts, winds blowing in from the south and west of India are strong enough to deliver carcinogenic matter in Kathmandu and farther. Delhi and the cities of Uttar Pradesh, which frequently rank among the worst polluted in the world, are just 300 to 500 miles respectively from Kathmandu in air distance. “Air movements from India are strong enough to whip pollutants towards Nepal and reach Kathmandu and farther,” said Raju Pradhananga, senior meteorologist at the Meteorological Forecasting Division, whose expertise includes wind movements. By contrast, there is minimal threat of trans-border air pollution from China, thanks to the Himalayan barrier, he added. Apart from local wind movements around the Indo-Nepal border, winds including the monsoons blow from India to Nepal from various directions depending on the time of year. The desert state of Rajasthan experiences dust storms at this time of year, and dust particles from there reach places in Nepal, mostly in the Tarai, according to Pradhananga. Apart from that, fumes from widespread agricultural burnings and industrial emissions blow in from beyond the border. Thousands of farmers in Punjab and Haryana, where much of India's wheat and rice are grown, set fire to their fields to burn off the straw left over from the harvest. The resulting smoke is toxic, which also blows towards the atmosphere of Nepal, a home to population of about 29 million. World Health Organization has acknowledged air pollution as a major environmental risk to health and stated that countries can reduce the burden of disease from stroke, heart disease, lung cancer, and both chronic and acute respiratory diseases, including asthma, by reducing air pollution levels. “We don't have direct control over trans-border air pollution, but we need to study it more, quantify it, speak up about it, and remind our neighbors that they too benefit from cutting their domestic air pollution,” Panday said. Environmentalist Bhushan Tuladhar, a technical advisor for South Asia at UN Habitat, stressed the need to work with other South Asian countries to implement the 'Malé Declaration on Control and Prevention of Air Pollution and Its Likely Transboundary Effects for South Asia', the first regional environment agreement in South Asia to tackle trans-border air pollution through regional cooperation. “But it would be difficult for us to control trans-border sources of air pollution. The priority for us would be to control pollution sources within our own country, something that we have control over,” he said.